Going cheap on a PC doesn’t always work out. Trade-offs made when deciding on parts often lead to short-term gains that can adversely affect the longevity of your gaming rig. Fortunately, at the $500 to $600 price point, those trade-offs seem to taper off. This is especially true for those willing to dip into their precious GPU budget to ensure they have a CPU that won’t bottleneck higher-end video cards they may purchase down the road. And with processors like the Ryzen 3 1200 entering the field, the budget-conscious gamer has more options than ever. For all the builds in our gaming PC builds series we try to incorporate the most relevant processors into our recommendations. Changes to these builds are generally updated quarterly or when new GPU or CPU hardware is released. In this post, I’ll take you through what I think is the best budget $500 to around $550 build available right now. If you find that it’s not enough, I’ll show you what I’d do with a budget of $100 to $150 more with a $650 to $700 PC build. For more, be sure to take a look at our 9 cheap gaming PCs from $150 to $1,000. Going from our $400 PC build to a budget of $500 we’re focusing on the hardware that will offer the most FPS increase in games and specifically the CPU and GPU. With much of that budget going to the CPU in the $500 build, I’ve offered a $550 alternative for those looking for a more substantial video card upgrade. Which build do you prefer? Both of these processors have 4 cores and are excellent budget CPUs. So, which one should you choose? First of all, the i3-8100 is the much better performer in games. So, if that’s your aim, we recommend it. That being said, the i3-8100 costs around $20 more and, at this point in time, requires a pricey Z370 motherboard. That should set you back at least another $50 to $80. So, this is more of a cost comparison than anything else. When cheaper 300 series motherboards come out for Coffee Lake, it’s likely the i3-8100 will be our only recommendation. If you prefer the less expensive AMD version of this Build, you’ll need to go with the Ryzen 3 1200. A decent B350 motherboard for overclocking is good and optionally a CPU cooler like the Hyper 212 EVO is good if you prefer a stronger overclock. You could also spend a bit more and go with something like the Ryzen 5 1600. Ryzen loves fast memory. So, for additional performance at a cost of $10 to $20 more, consider using ram that can reach 3000MHz speeds. We’ve detailed some good ideas for Ryzen and memory here. That being said, our $500 to $550 budget doesn’t necessarily allow for this. So, you’ll have to decide whether you think it’s worth it or not. If you’re looking for a good graphics card in the under $200 category, the RX 570 4GB and GTX 1050 Ti really shine here. The GTX 1050 Ti, at around *$130 to $140 (MSRP), is energy efficient and does a great job with even AAA titles. Still, at around $160 to $170 the RX 570 4GB, (when and if available) would be the more attractive option for most. It gives you better performance and can be the difference between playing some games on medium and high and ultra. Amidst the current cryptocurrency unrest, be sure to check a plethora of retailers for the best option available. Additionally, some patience may be required. We’ve written about how to purchase a GPU in the current market. Signing up for NVIDIA’s waiting list or purchasing a pre-built might just be the best option for some. For the AMD build you can use an inexpensive motherboard like the MSI Tomahawk B350. This is one of the huge pros for going with the AMD build. Less expensive B350 motherboards are also available. However, this is the one we like in terms of price and performance. This board is also featured in our CPU, GPU, and mobo combo list. 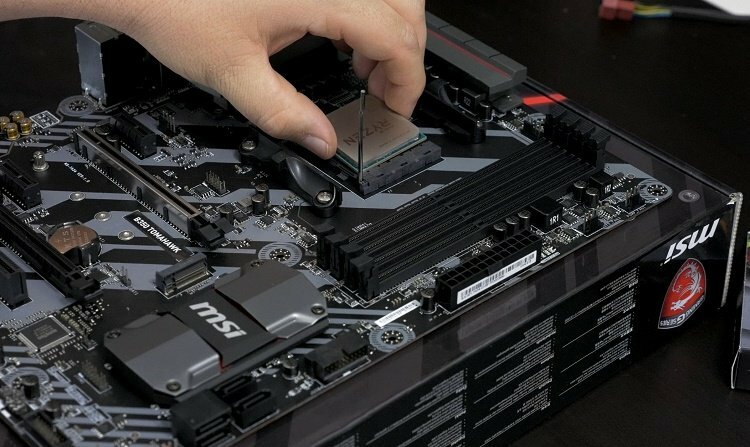 For a cheap Z370 motherboard, we like the MSI Z370 Gaming Plus. Since we’re not planning on overclocking this board has plenty of features for our needs. If you read this when cheaper H series 300 motherboards are available, that route may be preferable. Both Intel Coffee Lake and Ryzen prefer faster DDR4 memory. If you can find a kit with 3000MHz speeds for the same price, definitely consider it. You can check the prices of my favorite DDR4 memory for the money here. Ram is expensive in 2018. So, we’re going with a single 1x8GB kit in the G. Skill Ripjaws V Series. I prefer the 2x4GB kit; however, it may cost you a bit extra if you go in that direction. Computers continue to get more power efficient each year. This PC is no exception. Under max load, this PC should have plenty of power. For that reason, I’m recommending one of the smaller 80+ capacity power supplies that won’t break the bank in the Corsair 450W model listed above. Find it on rebate and you should be able to pay as little as $25 for it. The 500W version of this same PSU can often be found at a similar price if additional power is needed. Clearly, we don’t have a ton of money for storage in this build. We’re limited in capacity and options. So, I’m recommending a single 240GB solid state drive. If you need additional storage, try and reuse a drive from an old computer or pay up for something at least 2TB. Overall, I’d still rather have the speed rather than capacity here. There are a lot of different cases you could go with here. Corsair’s Spec 01 was listed above simply because its regularly on sale. The Corsair Carbide 100R, Thermaltake Versa H21, and many others are regularly available for around $30. Find something that has some decent built-in cooling. That should be enough for these lower power CPU builds. I’m satisfied with our $500 to $600 builds here. Unlike previous years, I feel like in 2018 the consumer finally has budget processor options that can carry them forward for several years to come. That’s a good feeling. Now if the GPU market would just stabilize, everything would be perfect. Just wait about a week for GTX 1050 launch. Have a question about it? Clearly you could go with less of a CPU and get something like the GTX 1060 3GB or RX 470 in here as well. IMO just doesn’t make much sense to go with such a low end card especially given the CPU you chose. I understand the premise of the write-up but I think for this price point you at least want to see some better performance than what that card can offer. I think you spend another 50-100 and get a better card. When you wrote this it may have been a 960 or a 390 but now….470, 480, or maybe even a 1060. Just my opinion though and that’s what makes PC’s so great is you can build a system to whatever your personal specifications are. Few questions I have here: What optical drive would you recommend for this build, What M.2 SSD would work with this build, and would a Cosair Carbide Spec 02 (Or 01) be compatible with the parts in this list? I’m brand new to PC building and I’d love to have this build as my first Gaming Rig. Thanks for your time. How upgradeable is the given Skylake build? Could you please describe a possible upgrade path to a computer noob like myself? Also, for the DISTANT future, Intel recently “released” some info showing that upcoming Kabylake CPUs will re-use the LGA1151 socket, so CPU upgradability with Skylake is confirmed! Does the Skylake need a cpu cooler? What kind of wireless card would fit into these?? Should it all fit together properly and worth getting if your on this budget? Good luck finding the r9 270x under $150….or even at all. It’s available on Newegg for that price right now after rebate. Amazon’s prices for the R9 270x are skewed.